What Can Dental Bonding Do for Me? Could Dental Sealants Help Me? Do You Have A Gap In Your Teeth? Do I Really Need Dental Implants? Can Dental Implants Help Me? What Do I Need To Do To Take Care of My Dental Veneers? Losing teeth will certainly disrupt your otherwise beautiful smile. It could also potentially affect your food choices and whether or not you receive proper nutrition. But something else just as consequential could be happening beneath the surface of your gums—you could be losing bone. 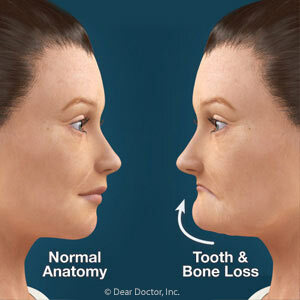 Significant bone loss in the jaw could adversely affect remaining teeth and facial structure, as well as limit your future restoration choices. To understand why this occurs we must first consider what bone is: living, cellular tissue. Like the body's other cells, bone has a life cycle: cells form, live and eventually dissolve (or resorb), and are then replaced by new cells. Stimulation from forces generated during chewing traveling up through the tooth roots to the jawbone keep this cycle going at a healthy pace. But when a tooth is missing, so is this stimulation. This could slow the replacement rate and cause bone volume to gradually decrease. The jawbone width could decrease by as much as 25% the first year alone and several millimeters in height after just a few years. Although dentures (a popular and affordable choice) can restore lost function and appearance, they can't duplicate this needed stimulation. They even accelerate bone loss by irritating and creating compressive forces on the bony ridges and the gums they rest upon. One restoration, however, can actually help stop bone loss and may even reverse it: dental implants. This happens because an implant's metal titanium post imbedded in the jawbone attracts bone cells to grow and adhere to its surface. This could actually increase bone density at the site. To gain this advantage, it's best to obtain implants as soon as possible after tooth loss. If you allow bone loss to occur by waiting too long, there may not be enough to properly support an implant. Even then it might be possible to build up the diminished bone through grafting. But if that's not possible, we'll have to consider a different restoration. To determine the condition of your bone after losing teeth, visit us for a complete examination. Afterward, we'll be able to discuss with you the best way to address both your overall dental health and your smile. Fortunately, the field of human prosthetic dentistry (or prosthodontics) is much more advanced than it is for our avian friends. We have several options for replacing missing teeth (as well as parts of missing teeth) that restore aesthetic appearance and functionality while potentially preventing other problems such as the drifting out of alignment or loss of remaining teeth. Bridges. As the name suggests, these custom-made devices span the area that is missing a tooth/teeth. Fixed (not removable) bridges are made up of an artificial tooth/teeth fused between two crowns that fit over your existing teeth or dental implants (see below) on either side of the gap. There are removable bridges, but they are considered temporary fixes. Dentures. These are custom-made removable replacements for missing teeth. Partial dentures offer a removable alternative to fixed bridges and are used when some teeth are missing in an upper or lower arch (jaw). Full dentures are used when all teeth are missing in an arch. Replacement teeth are embedded in an acrylic base that fits over your gums and mimics their color. Dental Implants. These are the closest thing to having your own tooth/teeth back. An implant is a small titanium post that is placed in the jawbone beneath the gum to serve the same purpose as a tooth root. Once the bone joins to the implant (a process called osseo-integration), a lifelike crown is attached to it. We would be glad to discuss which option would be right for you. If you have questions about tooth replacement, please contact us or schedule an appointment for a consultation. 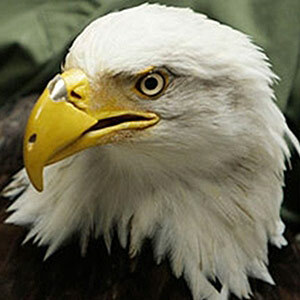 You can also learn more by reading the Dear Doctor magazine articles “Dental Implant Surgery,” and “Crowns & Bridgework.” Beauty the eagle’s story of rehabilitation can be found here: http://blog.theanimalrescuesite.com. Bone grafting is not new or experimental. It is actually a very routine part of the implant process, as well as other types of oral and periodontal surgery. And it is very successful when performed by an experienced doctor. Bone grafting materials are processed for safety. The grafts used — whether synthetic or from a natural source, such as cow or human bone — have been specially treated for medical use. Only a small amount of this bone-grafting material is needed. Once placed in the site of the missing tooth, it serves as a helpful scaffold your body uses to build more of its own bone in that spot. Your implant will be more ideally positioned and may work better. It needs a good, strong foundation with which to fuse. But when teeth are lost, this supporting bone is often lost, too. This loss is often unpredictable and bone grafting limits the change that occurs. In fact that's one of the main benefits of replacing missing teeth with implants: they help prevent bone loss just as a natural tooth does. Your implant will look so much better! Think about it: Your original tooth was supported to a certain height by the underlying bone. If that bone is now gone, the replacement tooth is going to be much longer because of the missing bone height. It may not look quite right without that additional support. So if you want the best-looking and best-functioning implant possible, have no fear of bone grafting. And please contact us to discuss any of your concerns, or schedule an appointment for an implant consultation.